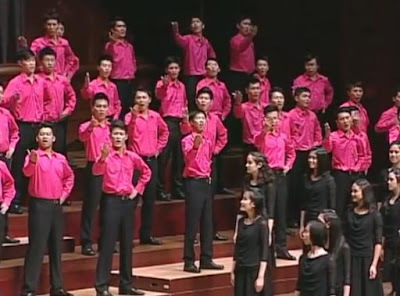 Jewish Humor Central: Jewish Traces in Unexpected Places: National Taiwan University Chorus Performs "Fiddler on the Roof"
Jewish Traces in Unexpected Places: National Taiwan University Chorus Performs "Fiddler on the Roof"
This has been quite a year for Fiddler on the Roof. After celebrating its 50th anniversary in June 2014, a major revival was launched last week at the Broadway Theatre in New York City. The new production, highly acclaimed in reviews in The New York Times and other publications, is stimulating new interest around the world in what has become a classic and universal story. Another 50th anniversary was celebrated just a year earlier in Taiwan, where the National Taiwan University Chorus marked 50 years on campus. The chorus consists of around 100 avid choral singers, none of whom are music majors. Bright and youthful, with promising potential and remarkably adaptable talent, singers of NTU Chorus delight in performing works from a wide range of choral repertoire, including canonic Western choral works, spirituals and gospel music, Chinese art songs, Taiwanese folksongs, operatic choral numbers, musical medleys, and commissioned works by Taiwan's own emerging talented composers. Last week they performed a 25 minute long concert version of Fiddler on the Roof that we hope you will enjoy. Don't they feed these people?